Is self-insuring a wise investment? Some may believe they can afford to self-insure. But even those with significant assets could erode their savings very quickly should they need long term care. The first concern should be whether or not you will be insurable in the future if you should decide later to buy insurance. Insurability is determined by: application information, phone interview, and medical records review. Not every applicant qualifies. If you have decided to self-insure it is recommended that you work with an estate and elder law attorney to make sure your assets are protected. More people are worried that the IRS will take a big chunk out of their estate than what they might pay for long term care. How much principal would you need to generate $6,000-$9,000 a month for care? For every $1,000 of monthly retirement income you want to generate from your own savings, you will need about $230,000 in assets, according to the Schwab Center for Investment Research. For example, if you want $3,000 a month, or $36,000 a year, you would need savings of $690,000. That's a conservative estimate, assuming that you earn 5.2% on your investments and live off the earnings without dipping into the principal. Got a pencil and calculator? The average nursing home stay is 2.5 years (excludes home, assisted living, memory care). The cost of nursing home care varies by location. In New York City the cost is $163,000/year and Athens GA it is $66,000/year. To find the average cost for your area you can call local care providers (https://www.NewLifeStyles.com). 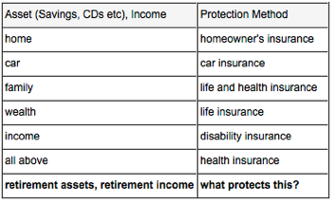 Do You Know If Are You Protecting Your Retirement? Can you think of anything other than the cost of long term care that could deplete your lifetime savings, retirement income, or portfolio? If you needed long term care tomorrow, what would be the consequences to those around you? In that situation it is the consequences that matter, not the money. Once someone needs care money no longer becomes an issue. Once someone needs care no amount of money can buy insurance. Their decision to self-insure will prove to be right or wrong. Would it have been a mistake to insure for Long Term Care? Which mistake would you rather risk making? For those who worry that they may die before they use their long term care insurance there are alternatives to use-it-or-lose-it long term care insurance. The only insurance that is guaranteed to pay is life insurance because it's the only event that is guaranteed to happen.